A new business coaching and development program has been launched, called Napkin-To-Exit. Participants get insider insights, information and guidance on a range of topics from marketing to mastering the pitch. A new business coaching program has been launched, called Napkin-To-Exit, which helps people to take their business goals from the idea through every phase of expansion to the big win. The team has the resources and connections to help people grow faster without any of the hassle. Participants in the program will learn all the essentials they need to know about every aspect of their business and how to develop it. They will also gain access to resources and connections to grow their business and achieve success faster. One of the things that often puts people off business coaching programs is the fact that they offer lots of information with very little action. That’s where Napkin-To-Exit is different, because every component contains action-oriented knowledge, exercises and checklists. The program is based on surveyed content, which helps to ensure it provides the highest quality material. Each member is asked about what aspects of business improvement they want to learn about, and the modules are created based around this. 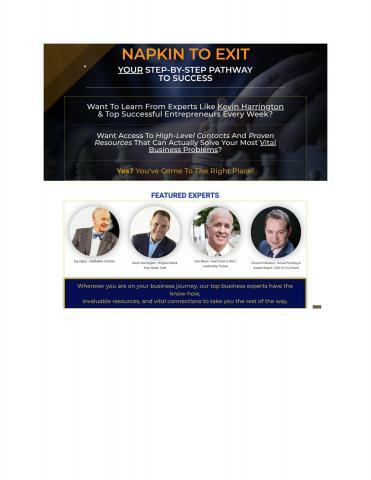 Participants get access to key insider information, coaching and guidance from business leaders like Kevin Harrington, an original shark from Shark Tank. He is heralded as being the inventor of the infomercial, and has helped numerous businesses to bring in over $100 million in annual revenue. Some of the topics covered include Social Media Fundamentals, Mastering Lead Generation, and Outsourcing Fundamentals. In addition to this, participants can become master of “the pitch”, whether this means pitching to potential customers, or pitching the company to investors. Every participant will also get access to a series of checklists and cheat sheets to take their marketing efforts to the next level. Full details of the program can be found on the URL above.